Jose Mourinho joins the League Cup legends, the Premier League has a new card-collecting enforcer - and is Tony Pulis hitting the peak of his powers? BBC Sport takes a look at the quirkiest and more interesting statistics from the weekend. Jose Mourinho's insatiable appetite for silverware shows no sign of abating as the Portuguese claimed the 19th major trophy of his career in Manchester United's thrilling 3-2 victory over Southampton in the EFL Cup final on Sunday. 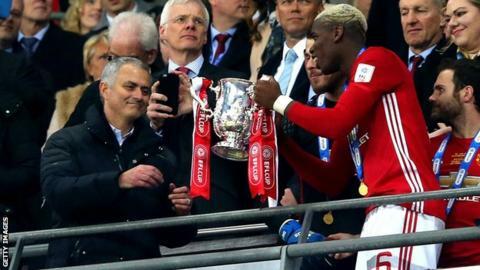 The competition's detractors may quibble about the League Cup being branded a 'major' trophy but Mourinho has always appeared to respect its challenge, equalling the legendary Sir Alex Ferguson and Brian Clough with four victories. Perhaps more surprisingly for such a storied club, this Wembley triumph saw the 'Special One' become the first manager in United's history to win a major trophy in his first season in charge. As any West Ham fan will tell you, reaching the 40-point mark is no absolute guarantee of Premier League safety, although it has proven to be enough ever since the Hammers' freak 42-point fall in 2003. Regardless, the landmark tends to allay most manager's fears of relegation so Tony Pulis probably slept that little bit better on Saturday night after his West Brom side brought up 40 points for the season with a 2-1 victory over Bournemouth at The Hawthorns. In truth, Pulis' Baggies haven't looked like going down all season and the Welsh boss has never failed to steer a Premier League side to the 40-point safety barrier, including campaigns where he took over mid-season as at Crystal Palace in 2013-14 and West Brom in 2014-15. Yet it is the speed with which this West Brom side have secured safety that is particularly impressive, becoming the first Premier League side under Pulis to reach the 40-point mark in February - he had never previously achieved it before April. This is also the quickest West Brom have reached 40 points in the Premier League and they look firmly on course to beat the club-record haul of 49 points set under Steve Clarke in 2012-13. Pulis' own points record is 47 as Stoke boss in 2009-10, when his side finished 11th - his joint-highest final position with Palace's remarkable 2013-14 campaign. That Palace escape saw Pulis named the Premier League manager of the year - yet with West Brom currently eighth and seven points clear of ninth-placed West Ham, perhaps Pulis is only now hitting the peak of his powers. Mauricio Pochettino may be biased, but watching Harry Kane dismantle Stoke in a 4-0 thrashing on Sunday, it was hard to disagree with the Spurs boss' assertion that the England international is one of the best strikers in the world. Of course, there is the caveat that Stoke were utterly abject in defeat and provided little resistance but, nevertheless, Kane's remarkable consistency over the past three seasons puts him in exalted company. His third hat-trick of 2017 means Kane has now surpassed 20 goals in all competitions for the third campaign running and, with 17 so far, he looks set to achieve that feat in Premier League goals alone too. That would see him emulate the likes of Alan Shearer and Thierry Henry in scoring 20-plus goals in three consecutive Premier League seasons, although they eventually kept that scoring rate up for four and five straight seasons respectively. Yet at only 23 and with 66 Premier League goals already, who is to say Kane can't keep his own run going? From illustrious to notorious company - Hornets hardman Jose Holebas reinforced his enforcer status in Watford's 1-1 draw with West Ham on Saturday by collecting his 12th yellow card of the season, more than more than any other Premier League player in 2016-17. The Greek also became the 25th player in Premier League history to pick up 12 or more bookings in a single season. The unwanted record of 14 is currently shared by Sunderland's Lee Cattermole in 2014-15, Newcastle's Cheick Tiote in 2010-11, Robbie Savage for Leicester in 2001-02 and Mark Hughes while at Southampton in 1998-99. Having picked up those 12 yellow cards in just 24 games, Holebas could surpass that rogues gallery this season - indeed only Magpies mauler Tiote has a higher cards-per-game ratio of those to collect a dirty dozen in a year. Holebas' reward if he makes history and reaches 15 yellow cards? A three-game ban. And finally, running into a former partner can be awkward but for most people the experience doesn't last 90 minutes with thousands of others looking on. Most people are not David Moyes. The current Sunderland boss saw his unfortunate record of losing to his former sides in the Premier League extend to five games as Everton beat the Black Cats 2-0 on Saturday. So spare a thought for the Scot when his relegation-threatened side face Manchester United on 8 April.